Ketchum Place is a small street on the Lower West Side of Buffalo. The street runs for just one block, between York Street and Jersey Street. The street is named after Jesse Ketchum. Mr. Ketchum was born in Spencerport, New York on March 1, 1782. His mother passed away when Jesse was six, and he and his ten siblings were distributed among various family and neighbors. The eldest Ketchum Sibling, Seneca, was 16 and was able to live on his own after the death of their mother. Jesse spent much of his childhood working on a farm from sunrise until sunset; he longed to go to school but was never allowed. It’s said that as an adult, he rarely spoke of the time between the age of six and adulthood. At the age of 17, in 1799, Jesse went to Little York, now Toronto, to where his older brother, Seneca Ketchum, lived. He went by foot to Oswego, where he was able to work for passage on a boat to Kingston, Ontario, and then on another boat for passage from Kingston to York. When Jesse arrived in York, Seneca put his brother in charge of his extensive farm. Both Jesse and Seneca fell in love with Ann Love, a young widow who worked as their housekeeper. They drew lots to decide who would marry her, and Jesse and Ann were married. Jesse and Ann had six children. In 1804, Jesse moved to the outskirts of York. He was successful in establishing a tannery there. During the War of 1812, he became rich while making shoes for Canadian and English soldiers. 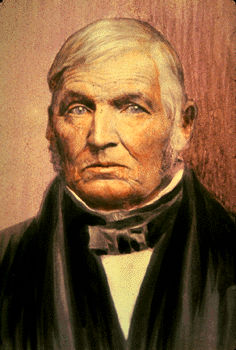 While in Canada, Jesse Ketchum served as Constable of York and a member of the Dominion Parliament. After Ann’s death, Jesse married Mary Ann Rubergall and had three more children. He recognized that Buffalo was becoming an important shipping hub due to the Erie Canal. In 1845, he moved to Buffalo. He purchased land on Main Street between Allen and High Streets to build a tannery. He continued to do good business at his tannery. He was successful at the buying and selling of farm lands just outside of Buffalo, north of North Street. Once he had made his fortune, he decided he was more interested in giving it away for the good of the community, rather than accumulate more wealth. He was considered a philanthropist around town, giving money to those who needed it during the cholera epidemic of 1849. During the Civil War, well into his 80s, Mr. Ketchum funded for the care of the families of enlisted men. One of Mr. Ketchum’s other activities in Buffalo was buying of homes and farms. He would “rent” homes and farms to deserving tenants. He would then take the rent they were paying and apply it towards the eventual purchase price, allowing people to own land who might not otherwise be able to afford. Mr. Ketchum lived in a 3-story brick home on North Street called “Tulip Garden”. The house was located at approximately 267 North Street. 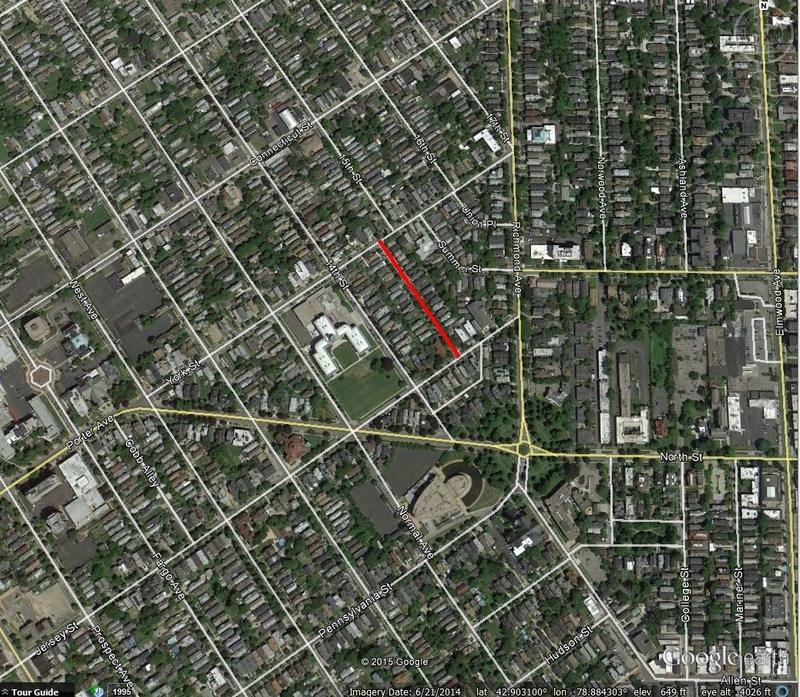 The home had 264 feet of frontage along North Street and the lawns and gardens extended to Summer Street. The house was a popular place for his children and their friends. A miniature train that was an exact replica of the then-new steam train connecting Niagara Falls and Buffalo ran trough his grounds. Mr. Ketchum served as President of the Board of Trustees of Westminster Church. He donated the land the church was built upon and donated $5,000 to the building fund. Mr. Ketchum also donated the 5-acres of land to build the Normal School (now Grover Cleveland High School). Ketchum Place is located close to the school. He was very interested in the City Public Schools. He would visit the schools and urge the children to be thrifty and abstain from tobacco and liquor. He’d teach them about how to be proud Americans (particularly during the Civil War) and would reward students who did well with prizes. He would visit every room in every school each year to deliver books to every student and teacher. It is said he did this to make up for his longing to read books as a child. Students referred to him as “Father Ketchum”. 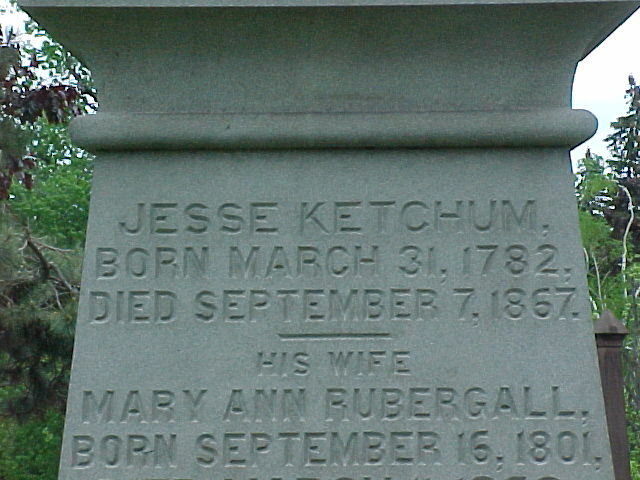 Mr. Ketchum died on September 7th, 1867. He was on his way to visit one of the schools when he felt a chill and returned home, where he died the next day. His funeral was held at Westminster Church and was one of the largest and most impressive ever seen in Buffalo at that time. The schools were closed as a tribute to their benefactor. He is buried in Forest Lawn Cemetery. Jesse’s son-in-law, Barnabas Brennan, inherited the estate. Mr. Brennan made a gift of $10,000 to Buffalo Public Schools for the awarding of medals for academic excellence, in honor of Jesse Ketchum. 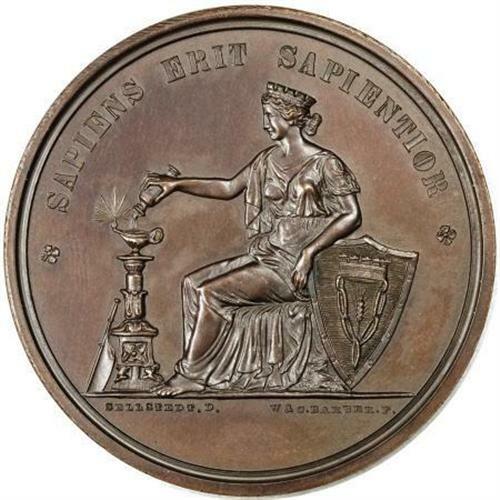 The first medals were awarded in 1873 and are still awarded today. Originally, medals were awarded to high school seniors and to grammar school students in the last two grades of grammar school. Since 1950, the medals are only awarded to 8th grade students. Approximately 15,000 medals have been awarded since 1873. 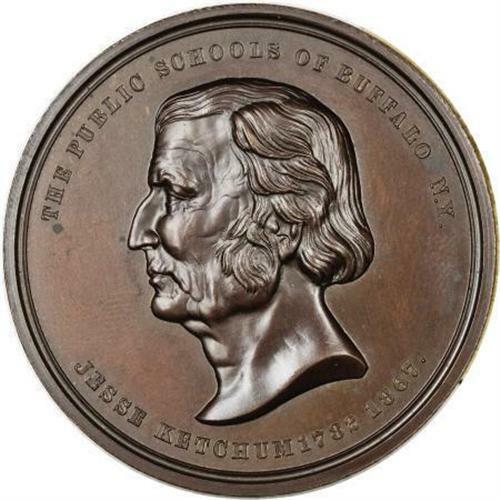 The Jesse Ketchum medal is the longest running medal for academic excellence in the country. Ketchum Hall, one of the five original buildings built at Buffalo State College (formerly the State Normal School), is named after him. In 1856, Mr. Ketchum donated land in the Village of Yorkville for a public park and for a “Free and Common School”. The school was replaced by a new school building, which was named the Jesse Ketchum School. 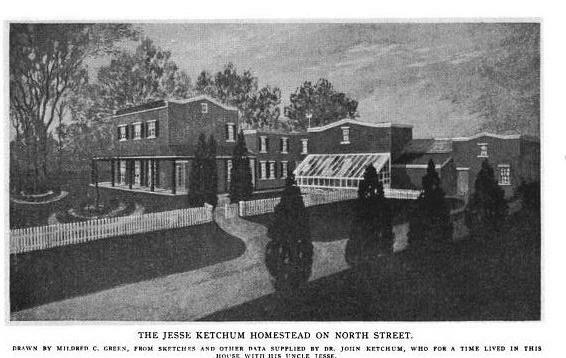 Jesse Ketchum’s descendants founded Ketchum Manufacturing, a company still located in Brockville, Ontario. Learn about other streets by checking out the Street Index! “Ketchum Place is Memorial to Donor of Scholarship Medals”. Buffalo Courier-Express, Sept 28, 1941, p. 15. Severance, Frank Hayward. The Picture Book of Earlier Buffalo. Hathaway, E.J. Jesse Ketchum and His Times. McClelland & Stewart, Toronto: 1929. I appreciate the work that goes behind these stories and their postings. Love the history. Kudos!!! Thanks Frank! I love sharing the stories…glad people appreciate the history as much as I do! I just did one via WGRZ that aired two days ago. Check out Features on their website and check out the Fallout Shelter segment. I saw that segment! It was super cool! I wonder how many other fall out shelters there are around town. I got to do a site assessment on an old airforce base for work, and got to check out their bomb shelter – we got a few of those cans of emergency water as souvenirs! Another fascinating read! Keep them coming, I love it! Wow! What a genuinely nice guy Ketchum seems to have been!